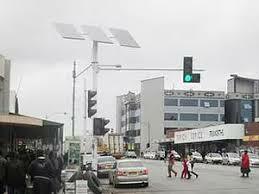 GWERU mayor Josiah Makombe has said the local authority’s lawyers are working to recover money paid to a Chinese company to instal solar traffic lights, but failed to complete the project, leading to the council terminating the contract. The municipality awarded the contract to Drewland, the Chinese company, in 2013 with a target of installing solar-powered traffic lights at 16 intersections in the city at a cost of $500 000. But when council terminated the contract over non-performance and sought to recover the money, Drewland challenged the move. “Our legal team is working on getting what was paid to the contractor,” Makombe told a Press conference last week. Five years ago, the council moved to replace all the traffic lights in the central business district with solar-powered ones following regular power cuts. The project also sought to reduce power costs incurred by the local authority from the electricity-powered traffic lights.